We are delighted to announce our new strategy. Our work in the UK will now focus on achieving six strategic priorities where we want to see change in the UK. We have designed new funds, some of which are open now, to help organisations and individuals to work towards these aims. We are also continuing with many of our existing programmes. 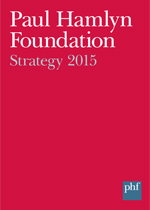 The strategy is the culmination of a review of our work, taking into account feedback from a consultation exercise, reflections on our previous work and conversations with grantees and the wider sectors where we operate. For full details, download the PDF.